Gee we are eating well at the Beach House lately. For those of you that are just joining us here, I have been on a diet for the last 4 weeks. 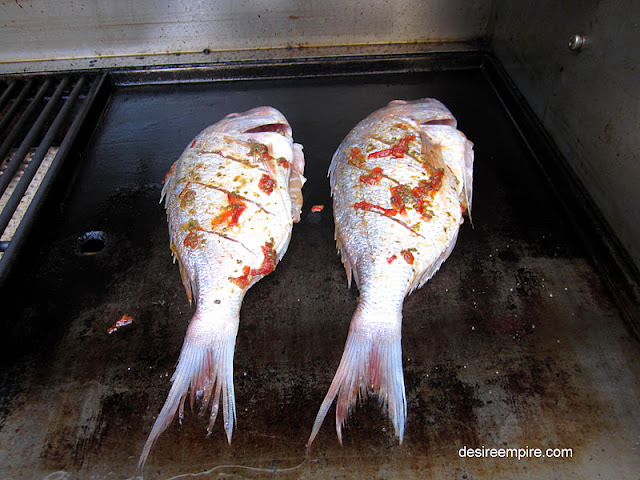 Last week I cooked this fabulous Asian Style Baby Snapper on the BBQ. Now I'm not sure what you will think of my manners, but I was mid sentence when I put the first morsel in my mouth and I have to say it blew me away. I definitely stopped talking. 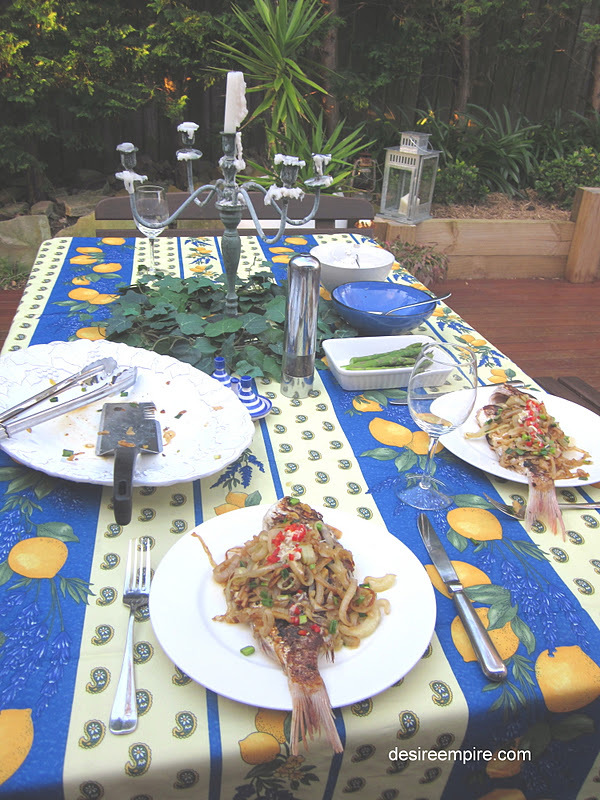 The fish was incredibly fresh and the Asian flavours were superb. I usually order this kind of thing when we dine out, but am trying all sorts of new recipes at home on this diet and surprising myself with their ease and ability to impress. I am sure I am becoming a food bore, but the diet is working and I seem to be eating quite alot. I haven't weighed myself for 10 days but, have moved up another notch on a belt I couldn't do up when I started and my gym pants are no longer tight, so something is working. Now don't get me wrong, I still have a long way to go to get back to the pre Beach House Brat svelte body that I left behind almost 10 years ago, when I stopped practising making babies and actually had some. But the thought and hope of getting back to, or at least close to a pre baby body, did not seem possible in my wildest dreams even 2 months ago. I am convinced weight loss is psychological and as I want it so bad, my mind set has turned around and what seemed impossible, has now become achievable. Part of this has been giving up all alcohol and sweet stuff. It's amazing when people ask what is happening with me and I tell them no alcohol........ for now anyway, their faces turn glum and they say 'I could never do that'. But when I honestly assessed the situation it went something like this....... I am a weekend drinker, but Friday and Saturday nights were spreading out to Thursdays and Sundays as well and then with the odd social midweek catch up, I was drinking most nights of the week. Well it's only for a little while and it's incredible how much better I feel without it. Anyway this is supposed to be about a provincial tablescape. I guess the shots speak for themselves. A very simple midweek at home date with Mr Beach House was just the thing. A relatively simple meal shared with my good friend Mr Beach House......sharing food with the people I love, now that is living. Fat or not!!!! 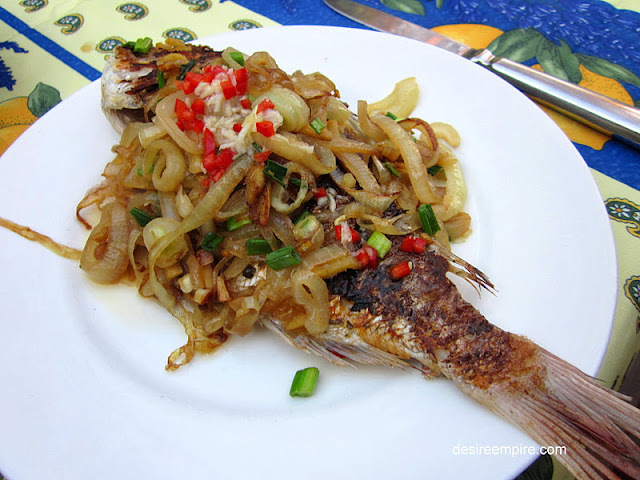 Mix the peppercorns, chillies and fish sauce to a paste and brush over the fish. Meanwhile, to make the lemon and garlic sauce, stir the lemon juice, fish sauce, sugar, chilli and garlic in a bowl. Heat the BBQ hot plate until very hot and brush with 1 tbspn of oil. 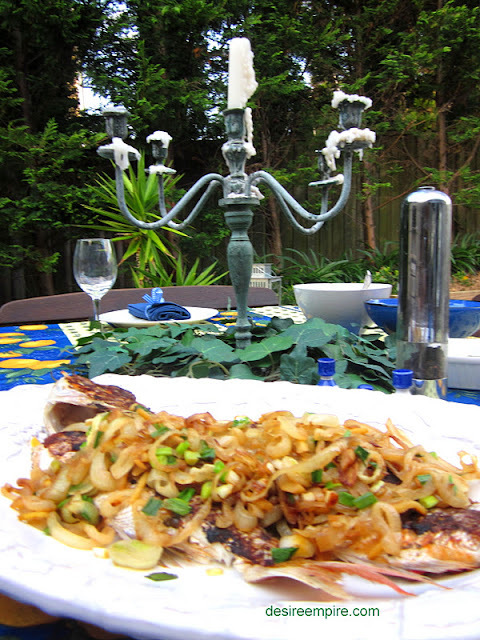 Cook the fish for 8 minutes on each side, or until the flesh flakes easily when tested with a fork. 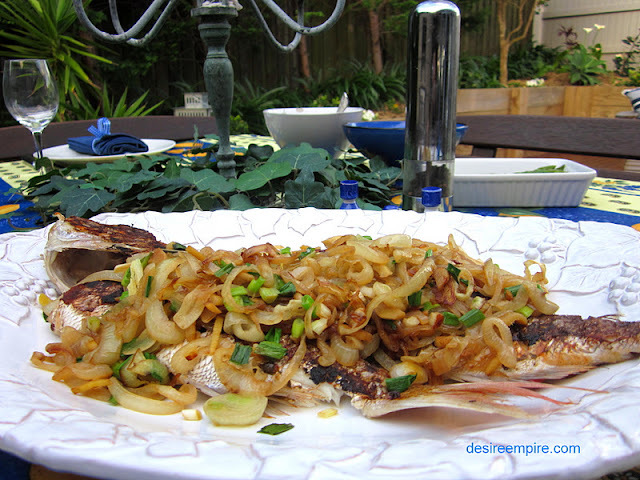 While the fish is cooking, heat the remaining oil in a pan and stir the onion over a medium heat for a few minutes, or until golden. Add the ginger, garlic and sugar and cook for another 3 minutes. Serve over the fish. Sprinkle with spring onion and serve with the sauce and steamed rice to soak up the sauce. For more easy healthy and delish family recipes go here. 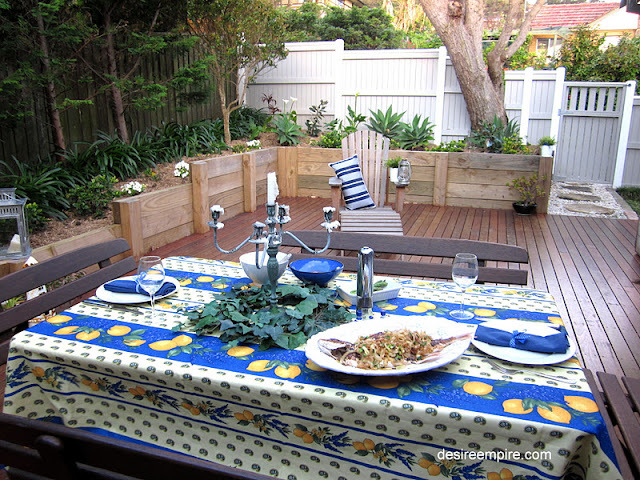 lovely photos..the table looks great and the fish amazing! Carolyn~ I have to say that is the prettiest fish all dressed up I have ever seen! It looks delicious! I could use some focus to lose a few. I seldom drink. Maybe once a month cause it makes me hot, but it's all the other stuff that keeps me up a bit. Thanks for the yummy recipes. I also prepared it at my home and added so much chilly powder and turmeric powder because I am too much crazy for its spicy test. there is nothing better than dining al fresco. With the cold weather coming on we will have to give that up until next Spring. Your table is so pretty! And yay on the diet. I gave up drinks long ago but unfortunately replaced it with sweets...ugh! Well done Carolyn, the snapper looks great. I'm trying to shift a few pounds myself - it's hard hard work and I need to get out and get walking asap. PS: I love the way you praise Mr Beach House on your Blog - and I'm sure he feels very much loved !! I'm following for the Terrific Thursday Blog Hop! Please follow me back at http://www.EcoCrazyMom.com. I'm so excited I discovered your blog, please feel free to add it to my Blog Directory under the "Bloggers Tab" if you'd like! That fish looks yummy and your table setting is lovely. 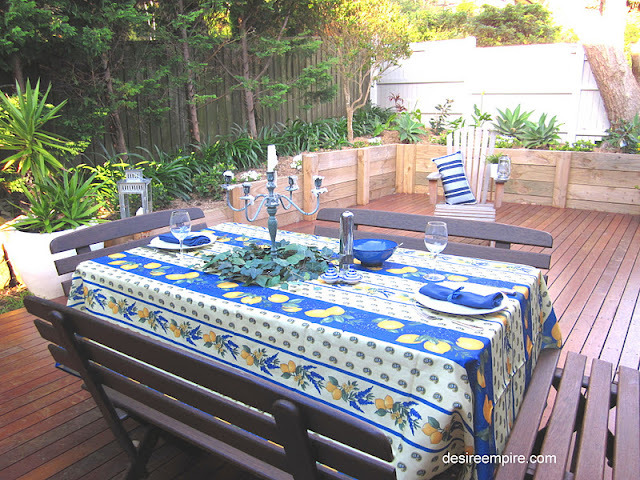 Thanks for linking up at Beach Cottage Good Life Wednesdays. Carolyn, that fish looks so yummy...beautiful table! Oh....I LOVE the whole fish on my plate! It looks absolutely yummy. So glad you thought to share these pictures with us! Good luck on your new eating habits; it'll be so worth it! Beautiful presentation! Restaurant quality!!! I salute you for your incredible "sticktuitiveness" with your diet. I need to find that same strength somewhere. It's doing a good job of hiding from me! :-) Good luck!!! !